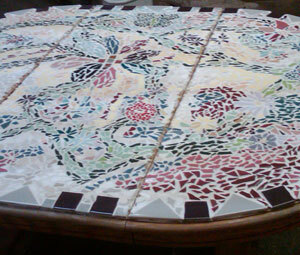 At Furniture Magicians, we are proud to offer a new service...Custom Mosaics! No matter how much we like to see finely finshed wood, nothing can change the appearance of your furniture like a unique tiled mosaic. Whether you are looking for that stunning dining room table to be the envy of all your guests or just want to have a unique and elegant piece to tie your room together, a custom mosaic could be the option for you! From tile selection to overall design, we will make sure you are part of the process and keep you up-to-date on progress. Ready to request an estimate? Visit our Contact Us page to send us a message or call us at (757)-874-2858.